Download Little Deals App and get CCD cappuccino offer worth Rs.100 at Re.1 only. You get flat 99% discount. With simple steps you can grab your cup of coffee at CCD for almost free. Do not wait Hurry Up!! 1. Download Little Deals Around You App here. 3. Select your city and enter 'CCD' in the search box. 4. CCD offer will be listed and select the deal. 5. Enter the coupon code 'CCD' and make payment with Paytm wallet for Re.1. Click on 'Use this deal' to get your coupon code. 6. Go to 'My deals' section in Little Deals Around You App on tap on 'Use the deal' to generate 16 digit eVoucher code. 7. Use this voucher code at the billing counter to enjoy the CCD cappuccino coffee for free. 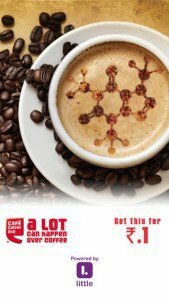 CCD Re.1 offer is valid at more than 1000 Cafe Coffee Day outlets across India. you can use the offer on any day in CCD. This offer is not Valid at Coffee Day Lounge, Airport, Square & Discounted outlets. Beverages should be consumed in the single visit & on a single bill. Offer is not valid on flavored Cappuccino (e.g. Hazenut, Irish, Vanilla, etc.). Voucher is valid till Jan 31, 2016.